This entry was posted in Infantry Combat, Recommendations, Reviews, Uncategorized, War Movie, WWII and tagged Hurtgen Forest, Infantry Combat, Movies, Reviews, War Movies, When Trumpets Fade, WWII. This movie meant a lot to me, as my uncle was a member of the 28th infantry and fought at the Battle of the Hurtgen forest. This battle is not known by very many people, as it was overshadowed by the Battle of the Bulge a few months later. Actually, in Band of Brothers, when the 101st is relieving the soldiers retreating at Bastogne, that would have partially been the 28th. They were sent to the Bastogne area for some R&R after losing upwards of 36,000 men in the Hurtgen. Great site, I’ll bookmark you! Your comment is greatly appreciated. Thanks. And thanks to your uncle. If there hand´t been brave men like him… I don´t even want to think about what the world would look like today. I haven´t included a Top 10 Favourite War Movies List yet but When Trumpets Fade is one of them, that´s for sure. 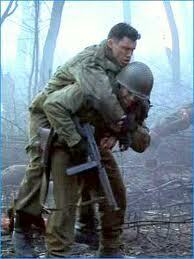 I really like Band of Brothers and funnily enough the part “Bastogne” was the one that impressed me most. Must have been interesting to hear your uncle talk about this. Is it in the list of the Military History Magazine? I am surprised as on those lists they always leave out TV productions and series. A real pity. Think of Band of Brothers and Generation Kill… Fabulous. It is not. In fact, now that you mention it – I don’t think there are any TV movies on the list. I certainly think it belongs. I disagree about BOB and Generation Kill. I am a huge fan, but consider them miniseries, not movies. Actually, now that I think about it – Gettysburg (#46) was made for TV , but opened in theaters because Ted Turner was so pleased with it. Sure Band of Brothers and Generation Kill are series, I said so, I just think it is a pity they are left out in those lists. I tend to forget this about Gettysburg. Now that is a movie I would like to hear your opinion about. I could imagine it is accuarate but I had a hard time watching it. When it comes to Cvil War Movies I prefer Glory and Ride with the Devil any day. I love Gettysburg, but put it behind Glory. Believe it or not I took my History Club on a field trip to see it. A 4 hour movie with high school kids. I enjoyed it more than they did to say the least. I give it very high grades for accuracy. It covers the great book The Killer Angels faithfully. The thousands of reeanctors would not have allowed any straying from authenticity. No CGI effects. Sadly, idiotic critics criticized the facial hair when it too was accurate. The segments involving the 20th Maine culminating in the fight on Little Round Top are fantastic! Joshua Chamberlain is one of my favorite war movie characters and in a surreal occurrence Jeff Daniels of “Dumb and Dumber” nails the protrayal. Watch for Ted Turner getting killed during Pickett’s Charge. Keep in mind it is rated PG which has its pluses and minuses. I think Gettysburg feels authentic, you don’t even need to know much to be aware of this. I just found it a tad long. Maybe too much of a history lesson for me. But I think it is recommended vieweing for anyone who want to know what this big battle was about and what it must have been like to be in it. You could argue the movie would have been better if it had concentrated on the 20th Maine (as “Glory” did with the 54th Massachusetts) and ended with the fight on Little Round Top. This is the climatic moment in the film and yet you still have another tow hours to go so the rest of the movie is a letdown. However, you obviously can not end a movie entitled “Gettysburg” before Pickett’s Charge. When trumpets fade was a great movies in all measures, except it still unknown one..
but i am asking if somebody knows, where was the place of making this film… the wood is very beautiful i hope i know where’s it. It’s a shame it isn’t know better but that is often the fate of TV productions. I just checked the location as I didn’t know it. And it seems as if it was filmed mostly in Hungary. Very beautiful, I agree. Thanks again for the lists… I’ve got a few more to check out. (also had a chance to see Kokota recently… definitely a thinker… though a tat predictable but good none the less. I’m glad you like When Trumpets fade. I think it should be wider know. It is one of my Top 10 favourites of all time. I loved the main character and the way he changed. The ending is great. I like movies set at that particulra time during WWII. the forest always add such an eerie feel. You are welcome. I hope to be able to add more lists soon. I am also still working on my Top 20. There are a few movies I haven’t watched yet and ma be included like The Winter War, a Finnish movie. I hear it is as goo as Stalingrad which is high praise, I think. I first saw this movie on HBO years ago and bought it on VHS as soon as I could. When it was released on DVD it became one of the first films I bought a duplicate copy of for the new format. Great movie, in my opinion it is better than SPR in many respects. Great site, I’ll be checking it out more. I totaly agree, I think it is one of the very best movies. I like it better than SPR. I’m glad you like the site. Thanks for telling me.